Transformers Titanium Series Cybertron Heroes Wave 1. 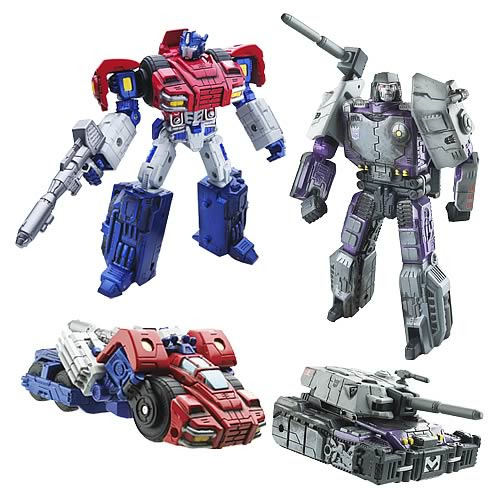 Includes 4 individually packaged transforming die-cast metal robots in disguise, including: 2x Optimus Prime (War Within), 2x Megatron (Tank). Gravitas and the members fo the Chamber of the Ancients have spoken. It has been determined that the fate of the Autobots will rest upon the shoulders of an archivist named Optronix. Although Optronix is initially reluctant to accept this great responsibility, he begins to understand the devastating risks at stake for the entire Transformers race. Optronix is given the leadership name of Optimus Prime once the power of The Matrix is bestowed onto him. It is a sign that he must lead the Autobots away from Cybertron, not only to escape the war with the Decepticons, but also to escape the self-destructive war that exists within them. After a colossal battle with Megatron that spans the boundaries of both time and space. Optimus discovers the power within himself to step up and provide the leadership his race needs in their most depserate hour. Megatron does not suffer fools gladly. Yet here he is, forced by the power of the Matrix to obey the commands of a simpering braggart in a hood, and a fleshing no less. Still, Megatron is nothing, if not patient. Let that shrill simpleton Cobra Commander collect his trinklets and treasures. Megatron will watch, and wait his time to strike. His chance is given him, shockingly, by the Autobots, whose cooperation with GI Joe has smashed Cobra's outer defenses. Feeding his own warriors into the furnace of Cobra Commander's insane tactics, Megatron holds one desire at the forefront of his mind, he will see his tormentor dead and the Matrix in his hand before the Autobots arrive.